Cormac McCarthy was born in Rhode Island. He later went to Chicago, where he worked as an auto mechanic while writing his first novel, The Orchard Keeper. The Orchard Keeper was published by Random House in 1965; McCarthy's editor there was Albert Erskine, William Faulkner's long-time editor. Before publication, McCarthy received a traveling fellowship from the American Academy of Arts and Letters, which he used to travel to Ireland. In 1966 he also received the Rockefeller Foundation Grant, with which he continued to tour Europe, settling on the island of Ibiza. Here, McCarthy completed revisions of his next novel, Outer Dark. In 1967, McCarthy returned to the United States, moving to Tennessee. Outer Dark was published by Random House in 1968, and McCarthy received the Guggenheim Fellowship for Creative Writing in 1969. His next novel, Child of God, was published in 1973. From 1974 to 1975, McCarthy worked on the screenplay for a PBS film called The Gardener's Son, which premiered in 1977. A revised version of the screenplay was later published by Ecco Press. In the late 1970s, McCarthy moved to Texas, and in 1979 published his fourth novel, Suttree, a book that had occupied his writing life on and off for twenty years. 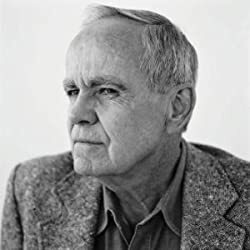 He received a MacArthur Fellowship in 1981, and published his fifth novel, Blood Meridian, in 1985. All the Pretty Horses, the first volume of The Border Trilogy, was published by Knopf in 1992. It won both the National Book Award and the National Book Critics Circle Award and was later turned into a feature film. The Stonemason, a play that McCarthy had written in the mid-1970s and subsequently revised, was published by Ecco Press in 1994. Soon thereafter, Knopf released the second volume of The Border Trilogy, The Crossing; the third volume, Cities of the Plain, was published in 1998.McCarthy's next novel, No Country for Old Men was published in 2005. Please enter your email address and click the Follow button to follow Cormac McCarthy!